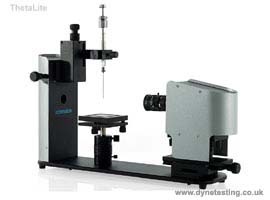 Dyne Testing UK offers the ThetaLite, a compact and robust optical tensiometer for simple and accurate measurements of contact angle, surface free energy, surface and interfacial tension, wettability, adsorption, spreading, cleanliness and surface heterogeneity. 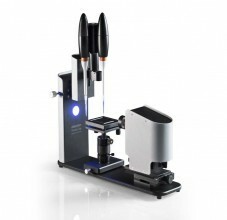 Also referred to as a goniometer and drop shape analyzer, the instrument enables the study of a number of material properties such as absorption, adsorption, cleanliness, spreading, surface heterogeneity and wetting. ThetaLite measures contact angles, surface free energy and drop volume. The available drop profiles are: sessile drop, pendant drop, captive bubble, meniscus and reverse pendant drop. The instrument is packed with smart features and is controlled with OneAttension software that has been designed for extreme user friendliness. The software analyses your results in real time and includes a batch quality control measurement mode for efficient industrial surface quality control. As standard the ThetaLite comes equipped with manual sample stage and one touch liquid dispenser, making it a convenient and cost-effective instrument for research, industrial processes and educational use. Choosing the automatic disposable tip dispenser system will ensure you don’t need to worry about cleaning as droplets are created precisely using a disposable pipette tip. The droplet volume is calculated from the real time image with advanced machine vision to ensure repeatability. Precise automated or manual droplet deposition will keep the droplet volume the same each time and minimises any result variation and the high resolution camera will minimise any optical variation. Designed for high accuracy the ThetaLite is the ideal entry level instrument for anyone looking for an incredibly easy to use contact angle measurement instrument. What’s more, the system comes fully assembled and with quick start guide so you can start performing within minutes. 2GHz processor, 2GB RAM, 120 GB hard disk drive, 1024 x 768 resolution, 1 USB2 or USB3 port, 1 x USB 3 port.